Darien’s Emma Lesko, center, fights to recover a loose ball between Ludlowe’s Paige Wilkman, left, and Amanda Schramm (21) during the first half Thursday in Darien. DARIEN — The machine keeps marching on. The names change but the results remain the same for the Darien High School girls lacrosse program. The Blue Wave remained unbeaten this season by vanquishing Ludlowe 19-6 Thursday at the Darien football stadium. Darien (3-0 overall, 2-0 FCIAC) led 6-0 and 9-1 while building a halftime cushion of 12-2. 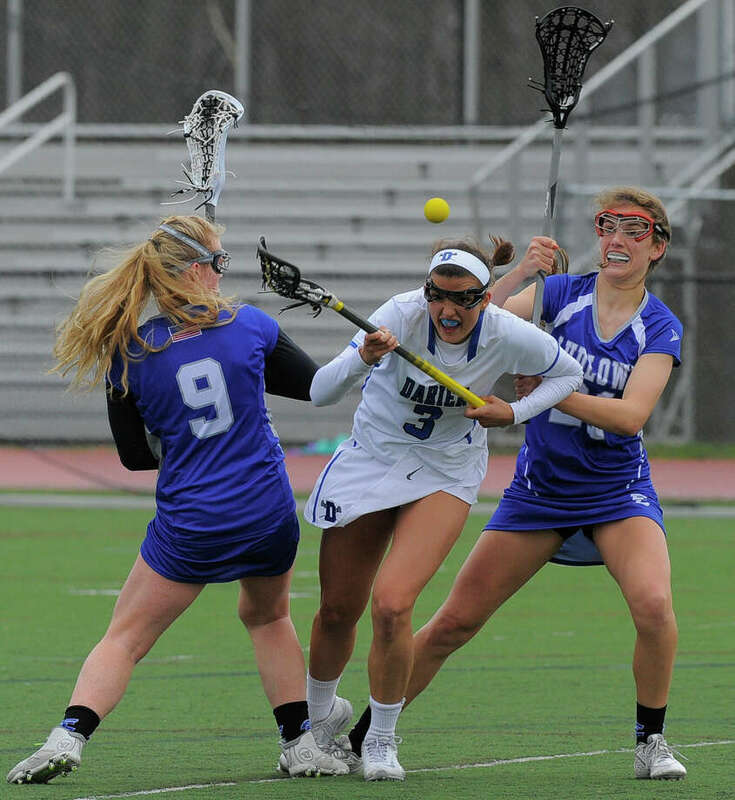 Every minute of every Darien girls lacrosse contest is an opportunity to impress as the deep Blue Wave varsity roster (31 players) is in a constant state of audition. Who can contribute on faceoffs? Who can add length and size on defense? Who brings unique skills to the massive offensive playbook? Laura Murphy paced the Blue Wave scoring Thursday with six goals (five in the first half). Chandler Kirby (two assists) and Susannah Ropp (one assist) each tallied three times while Kaeleigh Morrill scored two goals. Darien rang three posts in the clash. Darien’s new starting goalie Carly Schoudel registered six saves before ending her afternoon with 14 minutes to go. It was a solid showing for Darien, which is ranked No. 15 in the nation in the latest Under Armour / Inside Lacrosse National Top 25 Girls Lacrosse poll. The best yardstick for the Blue Wave will come next week when their school is on vacation. Darien will play three road games at No. 4 ranked Garden City (N.Y.) on Monday April 11, at Notre Dame Academy in Massachusetts (Top 35) on Wednesday, April 13 and No. 11 ranked West Islip (N.Y.) at Cold Spring Harbor (N.Y.) on Saturday, April 16. “These could be our three toughest games of the season,” Lindley said. Ludlowe (1-1) is in some flux as the Falcons are coming off an 11-6 campaign in 2015 but graduated a large group of seniors. The 2016 Ludlowe squad has just two seniors. Senior Regan Steed (a Columbia commit) had a big impact Thursday, scoring four of the Falcons’ goals. Junior Emily DeMaso (who has committed to Holy Cross) finished with a goal and an assist. Records: Ludlowe 1-1; Darien 3-0, 2-0 FCIAC. Scoring: L — Regan Steed 4 goals; Emily DeMaso 1g, 1 assist; Melissa Bucher 1g. D — Laura Murphy 6g; Chandler Kirby 3g, 2a; Susannah Ropp 3g, 1a; Anna Stein 1g, 2a; Kaeleigh Morrill 2g, 1a; Schuyler van den Broek 1g; Katie Cronin 1g, 1a; Emma Lesko 1g; Christine Fiore 1g, 1a; Mason Maloney 1a. Goalies: L — Grace Flink (2 saves); D — Carly Schoudel (6 saves); Georgia Cassidy (1 save), Ellie Taney (1 save).